Architect: ZGF. Contractor: Hoffman Construction Company. Engineer: KPFF Consulting Engineers, Interface Engineering, Arup, Haper Houf Peterson Righelis. Artists: Rosa Serra, Basil Childers, Bob Lambie, Lamer Woodworking, Tice Industries. 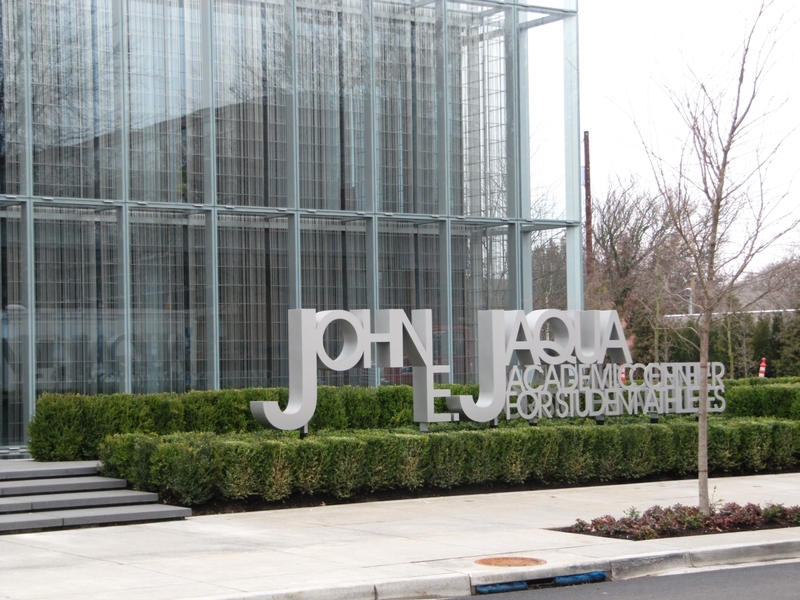 The John E. Jaqua Academic Center for Student Athletes is named for the late UO alumnus and founding board member of Nike. The center contains over 40,000 square feet of space, including a 114-seat auditorium, 54 computer stations, 35 tutor rooms, 25 faculty offices, computer laboratory, graphics laboratory, teaching laboratories, a library, and a café. The designers, ZGF Architects, received the 2011 AIA Institute Honor Award for Interior Architecture. "University of Oregon John E. Jaqua Academic Center for Student Athletes / ZGF Architects. 22 May 2011." Arch Daily . "2011 AIA Institute Honor Awards Recipient". 2011. AIA Institute Honor Awards for Interior Architecture .